Lying near the banks of the river which just centuries ago teemed with Chinese junks and spice-laden vessels from all over, The Majestic Malacca is a unique property in an already special town - Malacca is one of the more interesting parts of Malaysia. 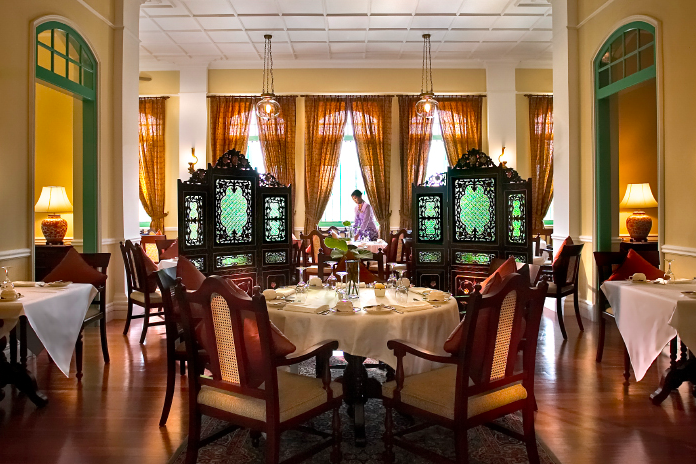 The heart of the hotel is a restored 1920s Straits Settlement mansion, and when you look down, you can still find its original porcelain tile flooring and teakwood fittings in some parts of the property. The lobby is a beautiful thing, filled with fresh flowers, traditional porcelain lamps, and smiling faces greeting us on the way in. Meanwhile, a small bar by the side offers tasty cocktail classics, some of them prepared with a spirit designed for the city: the spicy Tanqueray Malacca gin. You'll want to drop by the Library, where welcoming leather sofas and armchairs invite you to sit back with a collection of well-preserved books from the past. Admire the fine ceramic ware and portraits of the past bathed in soft light streaming through louvered windows. 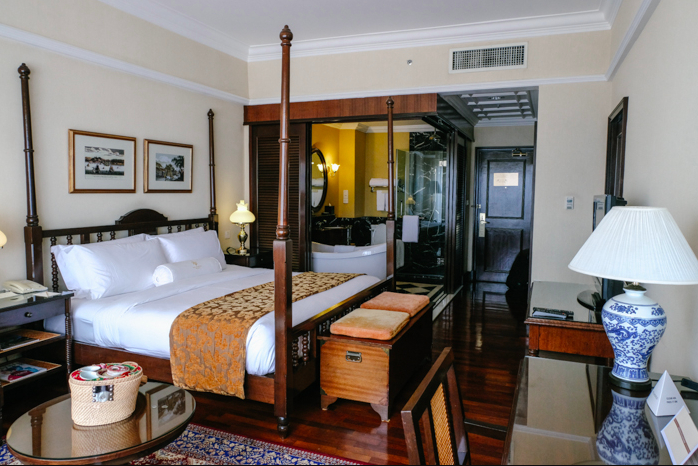 The Majestic Malacca's rooms are sumptuously spacious, and that includes the starter-tier Deluxe Rooms. At 35sqm, ours is appointed in an elegant combination of tradition, modernity, and luxury, the bespoke furnishings offering an insightful glimpse of old Malacca. The floors are warm timber and the bed a glorious four-poster finished in rich teak - oh, it's also really comfortable. To match, a silk chaise lounge serves as a cosy throne to gaze far out onto the city's west. The 'open-concept' toilet is a refreshing touch, and nothing says luxury like a large clawfoot bathtub, and boy is it a delight to use. Fold back the screen doors to chat to your partner or watch a movie on the TV while relishing in a fragrant bubblebath. The two signature suites - the Majestic Suite and Tranquerah Suite - on the top floor of the hotel also comes with a separate living area and a powder room, commanding views of the Malacca River and the quaint Malay village Kampung Morten. Without a doubt, the most unique feature in the hotel is its award-winning spa, bathed in muted sunlight from floor-to-ceiling windows and intricate wood carvings. Spa Village Malacca is the only one of its kind in the world to base its therapies on Peranakan culture - a mix of Chinese and Malay traditions. Start with a soothing hair care ritual inspired by the colour 12-day Peranakan wedding ceremonies as you look up into a TV screening old black-and-white P. Ramlee films. Then, continue on to a treatment determined through a brief personal consultation. Got a 'cool' body? 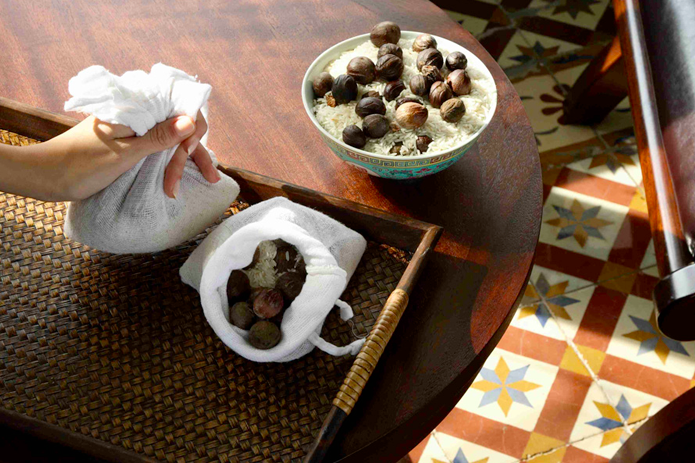 Go for a warming Nutmeg-Rice Rolling Massage, where nutmeg and rice are massaged onto your body to reduces aches and wind from your muscles. Equally fascinating is the cooling Egg Rolling Therapy, which is fascinating to say the least. Getting hardboiled egg applied on your muscles apparently settles cramps and swelling, and draws out excess heat. You'll walk out feeling like royalty. Looking for a refreshing dip or to soak up the sun? Between the original building and hotel extension sits a beautiful outdoor swimming pool. There are also stylish loungers that invite you to relax with a cold drink in hand. Right beside the pool, a glass-enclosed gymnasium offers a decent range of exercise equipment for a particularly scenic poolside workout. Part of Malacca's charm is the incredible diversity of its Kristang cuisine, a curious marriage of culinary traditions with strong Portuguese, Dutch, Malay, Indian, and Chinese influences. Fiery sambals and fragrant coconut curries are the norm at The Mansion, which sits above the hotel lobby. It's a labour-intensive cuisine, and we can only imagine the hours of pounding fresh herbs and spices using a pestle and mortar to achieve peak flavour. The Aros Fretu Keluak, or wok fried rice with keluak sambal and chicken is a must-order, as are their slow-cooked dry curries (Kari Seccu). A new epicurean experience, Gin O'Clock, invites you to play the part of renowned mixologist by mixing your own gin-based cocktails (with a Malaccan twist) from an interactive gin cart. You can even take home recipe cards to recreate them at home. If you can't figure out what to do in Malacca, the hotel has you covered. Take a complimentary guided Historical Walk around prominent landmarks of the 600-year-old coastal port and pass through prominent landmarks like Jonker Street, Cheng Hoon Teng Temple, Tranquerah Mosque, and the red brick Tang Beng Swee Clock Tower. Trishaw rides through the old sector and a 45-minute river cruise up the Malacca River to Kampung Morten can also be arranged with the concierge. Enjoyed your meal at The Mansion? 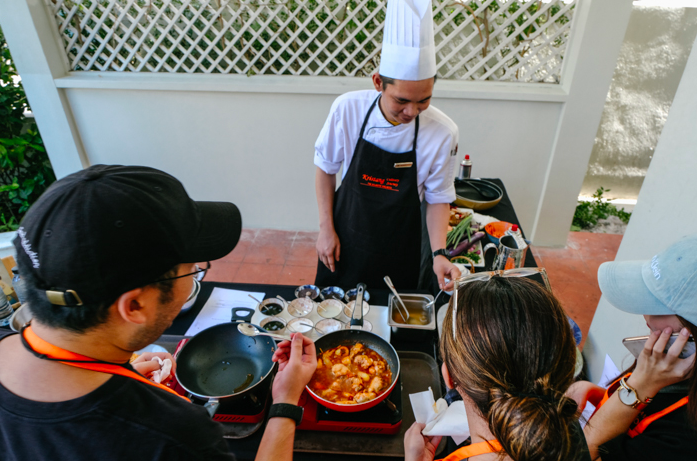 Learn to cook some of your favourite dishes with The Kristang Culinary Journey, which first takes you to the nearby Malacca Market for a food tour and through two dishes selected from the restaurant's menu. Pro tip: the Devil's Curry is a lot of fun to make! 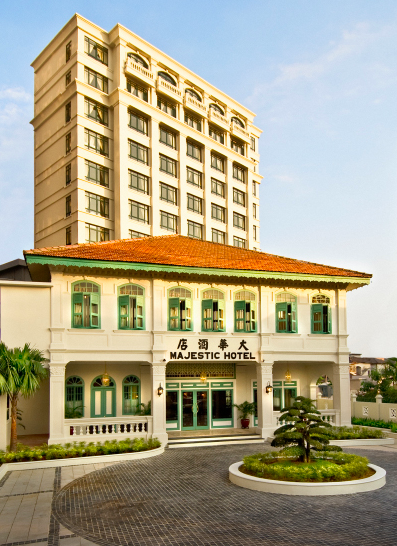 The Majestic Malacca is located at 188 Jalan Bunga Raya, 75100 Melaka, Malaysia, p. +60 6 289 8000. Rates start at USD$142 (S$190) per night.